Hot on the heels of a full on day at Nha Trang we are up at 7:30 and ready to set off to Saigon (Ho chi Minh city ) we arrive part way along the great Mekong river. One side developed to an industrial port the other side clearly a marsh / mangrove. Just a note on covering people's face. The girls here always cover their face, hair legs etc. I originally thought this was for germs or the fumes from traffic. However this is not the reason it is to keep the sun off their skin. The Lighter the skin the prettier they are seen to be. Well here I sit at the Rex hotel - where the US reporters spent the Vietnam war. I'm sipping a Saigon iced tea cocktail and I get a message from Infanta who asks me if I've tried the cashews and I'm eating them with my drink how spooky. it seems special writing this blog from where news reports that were so iconic for me as a child were written. 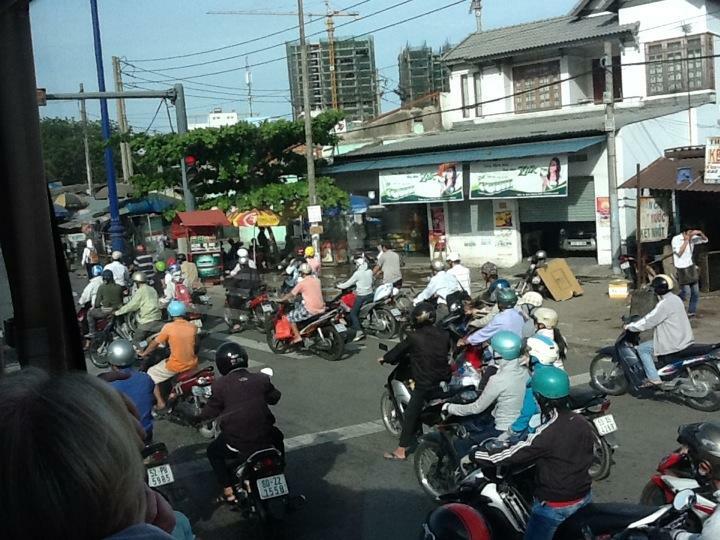 The streets are teeming with mopeds and lunatic drivers. I've spent all my dongs on tog barker clothing and Roy Ban sunglasses! I actually saw some real designer stores today, God knows how on earth they sell anything here. I've figured out the refuse collection system now. Two options You put everything in the drainage canals they flow into the Saigon river and it collects at the side here and there and it's collected and sifted through by the poor. Second is to collect it at the side of the road and burn it just feet from a stall selling food. Seems to work but I'd be reluctant to eat the fish or crab from the rivers there! The City is largely new buildings anything old has a French influence. The most spectacular of all is the post office which is fantastic. They also have the Notre Dame cathedral here which is French built. I got to see the reunification palace and the US embassy where the last few south Vietnam supporters and Americans were collected by helicopter at the end of the war (April 1975). The palace has exhibited the two tanks that drove through the embassy gates. I hope I never complain about my standard of living having seen how the locals here live. Quite humbling really. Another curiosity is the fact that this is still a communist country but I've never been anywhere where capitalism and small traders are more prevalent. Not sure I'd live here but a real privilege to visit it and to meet the local people who smile through very tough lives.